The Elevate 300 hour Advanced training looks deeply into what means to walk the path of a Yoga Teacher. Our core philosophy is that Yoga is for everybody and our methodology honors the uniqueness of the individuals we teach. Our goal is to help you feel more connected to your students so that you may offer them expertly crafted practices that best support their health and well-being. As a sangha, we aim to give you a safe space to explore the depths of your own path as you continue aligning your life with the teachings of Yoga while learning from your embodied experience. Joelle and Sarah bring over 20 years of experience adapting Yoga to the individual needs of students, and through those years have developed a framework to understand how Yoga interacts with the whole of who we are: individuals, with unique bodies, life experiences and goals. The foundation of this approach is awareness and relationship, as taught in the traditional teachings of Yoga. 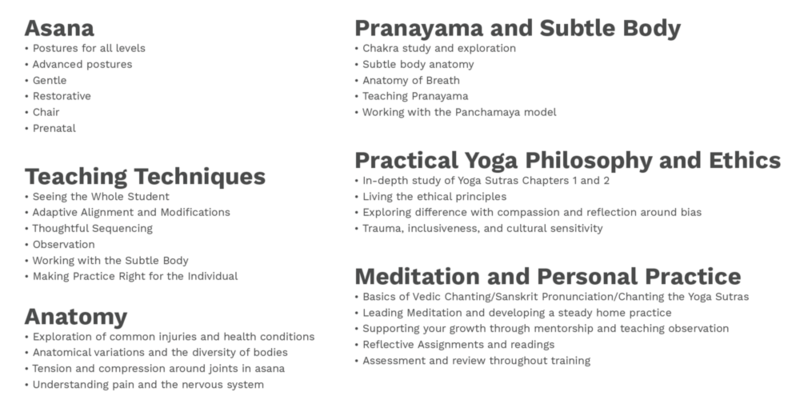 We offer unique support for teacher trainees through in-depth exploration of alignment-based Yoga and breathwork, training in the art of observing students, rigorous study of the Yoga Sutras and ethics, and attentive, compassionate one-on-one mentorship. This training is for practitioners who are passionate about not only bringing the tools of Yoga to real people with care and awareness, but also as an exploration of how Yoga can be a source of self transformation. We are looking forward to being with you on this journey.